Without accurate wind speed measurement ability, the movement of sands across Mars cannot be understood. Without accurate pressure measurement, the power of the winds cannot be understood. Without an accurate portrait of both, the truth about Mars is obscured. From August 22, 2012 to January 2, 2013, every single weather report from the REMS Team and Ashima Research has indicated an average daily wind of 2 m/s with no variation in wind direction either - always from the east. Based on observations from the Viking landers, this is nonsense. REMS has been designed to record six atmospheric parameters: wind speed/direction, pressure, relative humidity, air temperature, ground temperature, and ultraviolet radiation. All sensors are located around three elements: two booms attached to the rover Remote Sensing Mast (RSM), the Ultraviolet Sensor (UVS) assembly located on the rover top deck, and the Instrument Control Unit (ICU) inside the rover body. The booms are approximately 1.5 m above ground level. Boom length is similar to the RSM diameter, and therefore the wind flow perturbation by the RSM may reach the boom tip where the wind sensor is located. The two booms are separated in azimuth by 120 degrees to help insure that at least one of them will record clean wind data for any given wind direction. The figure below shows the booms’ relative position. There is a 50 mm height difference to minimize mutual wind perturbation. Boom 2, which points in the driving direction of the rover, has wind sensors and the relative humidity sensor. Boom 1, which looks to the side and slightly to the rear of the rover, hosts another set of wind sensors and the ground temperature sensor. Both booms have an air temperature sensor. See Figures 6 and 7 below. Wind speed and direction will be derived based on information provided by three two-dimensional wind sensors on each of the booms. The three sensors are located 120 degrees apart around the boom axis. Each of them will record local speed and direction in the plane of the sensor. The convolution of the 12 data points will be enough to determine wind speed as well as pitch and yaw angle of each boom relative to the flow direction. The requirement is to determine horizontal wind speed with 1 m/sec accuracy in the range of 0 to 70 m/sec, with a resolution of 0.5 m/sec. The directional accuracy is expected to be better than 30 degrees. For vertical wind the range is 0 to 10 m/sec, and the accuracy and resolution are the same as for horizontal wind. As mentioned previously, the wind field at the booms will be perturbed by the RSM and by the rover itself. Calibration will be done via a variety of wind tunnel tests under Mars conditions as well as numerical analysis. Simulations will be used to obtain results where tests conditions cannot be reproduced on Earth. Additional detailed information about the REMS sensors is HERE. 2.b. The Partial (or total) Malfunction on Landing. This section is lifted directly from Spaceflight 101. Comments by Barry S. Roffman are shown in blue. "During REMS checkouts, it was found that the boom looking to the side was sending saturated data at either high or low levels which was not valid." The broken boom that looks to the side is Boom 1. In Section 2.a. above it was claimed that it hosts another set of wind sensors and (only) the ground temperature sensor. However, on Figure 6 below it is seen that Boom 1 houses both ground and air temperature sensors. Boom 2 only has an air temperature sensor (plus the relative humidity sensor) leading to questions about whether any ground temperatures published are correct. Since the only sensor with ground temperature measuring capability was damaged, there is reason to question the legitimacy of the ground temperature graph published by NASA and JPL for MSL 10 to 11.5 HERE. A description of the relative humidity sensor is HERE. The article on Spaceflight 101 continues: "The issue was traced back to the exposed circuit boards and it was determined that two of three boards on the boom in question had damaged wiring. Teams assessed the situation and came to the conclusion that this type of damage was permanent without a chance of recovery. The REMS instrument and its wind sensors were successfully checked during cruise so that instrument health following launch and ascent aboard the Atlas V rocket back in November 2011 was confirmed. With the instruments starting to send bad data after landing while functioning during cruise has led to teams assuming that the instrument's circuit boards were damaged during Entry, Descent and Landing. Ashwin Vasavada, Curiosity deputy project scientist, has stressed that there is no way of finding out what exactly happened to the hardware, but that teams have developed the hypothesis of small rocks damaging the tiny wires of the circuit boards during the propulsive landing. Following landing, images have shown small pebbles on the Rover Deck that were picked up by the Mars Landing Engines while the Descent Stage was hovering above Curiosity during landing. Possibly, these pebbles could have hit the fragile hardware on the mast which was in its stowed position with the REMS booms facing outward, leading to the damage teams are seeing. With one damaged wind sensor, teams will have to learn how to put the one remaining sensor to best use to provide wind speed and direction data to support the science goals of REMS." As of January 2, 2013, there is no evidence that they are succeeding. Every single weather report by the REMS team has listed the wind at 2 m/s from the east. Ashima Research, who draws its information from REMS, uses the metric equivalent of 7.2 km/h every day. It would seem more honest to simply list the wind as the REMS team lists the relative humidity (-- or not available). See Figure 5 above for a comparison of REMS and Ashima reporting styles. Figure 6 - The Remote Environmental Monitoring Station (REMS) weather booms on MSL Curiosity. 3. Wind reports issued to the public. Figure 8 shows the REMS Team weather reports issued to the public between August 29 and September 6, 2012. Daily checks through January 2, 2013 show the same stuck wind speed. We maintain the full set of reported REMS and Ashima weather data with winds at our MSL Weather Record. Given the admission above about broken Boom 1, to continue to publish the same exact wind speed every day from August 22 to January 2, 2013 is misleading the public. The 2 m/s from the east figure is nothing more than a guess. What that means for Ashima Research is that to this point, there are two key aspects of the report that are meaningless – sunrise/sunset times and wind. Figure 8 below - REMS weather reports between September 1 annd 5 jumped 7.42 Pa to as much as 747 hPa likely, but not necessarily due to failure to make the right conversions between hPa and Pa pressure units. REMS also listed the wrong month on Mars, no relative humidity and never changing winds. The latter 2 problems persist al least through January 11, 2013. As is discussed elsewhere, Ashima Research adds to the problems by posting never changing AND ALWAYS DEAD WRONG sunrise and sunset times (always sunrise at 6 AM, sunset at 5 PM). 4. History of wind measurement problems on Mars. In Equation1 R(1) = distance between pivot and center of mass, M = non-counter-balanced mass, g = acceleration of gravity, R(2) = distance between pivot and center of aerodynamic pressure, A(d) = effective aerodynamic cross-section, and rho = atmospheric density (a function of pressure, temperature, and molecular weight). An MPF hot-wire anemometer also had calibration problems. Such technology is sensitive to pressure, gas composition, air temperature, and their own overheating which may induce systematic errors (Pedrero, Jaime, 2010). Schofield et al. (1997) indicate that while Pathfinder was operational from July 4 to September 27, 1997, it had no pressure data for the most crucial sol – its first operational day on Mars. The reason given by the above reference is there were “various spacecraft software reset and downlink problems.” If the problems only occurred after the first day and if the first day’s pressure data was consistent with the Vikings, then Pathfinder’s data could be used to refute the claims made in our report, HIGHER THAN ADVERTISED MARTIAN AIR PRESSURE. However, that is not the case. We are still dealing with a Tavis transducer with no way to keep the dust out of its pressure tube on or in the seconds before landing, and no way to change a clogged dust filter. The critical time is in the final landing process. So when the spacecraft has to reset the software and correct downlink problems then, the issue of exactly what is entailed in these corrections becomes one of extreme importance. J. Gómez-Elvira et al. (2012) claim that hot wire anemometry was used in the Viking mission and from then on, has been a reference in the design of wind sensors for Mars due mainly to its simplicity. Frankly, an old fashion anemometer with spinning cups (and varying pressure-related thresholds for movement) and a wind sock would seem a lot simpler. In support of this as mentioned above NASA never succeeded in calibrating the anemometer on Pathfinder. REMS follows the Viking design and uses thermal anemometry to record the wind speed also. Now we face a situation on MSL where one boom is out of service. Even had both booms survived the landing REMS, unlike previous landers with an arm or mast that isolated the wind sensor from the lander body, wind data would have been be strongly influenced by the rover body and some of its appendages (e.g. masthead, RTG, robotic arm). As for how the Viking landers compared to MSL, the Vikings wind sensor assemblies each consisted of two hot wires oriented at right angles to each other. A reference air temperature was measured using an identical hot wire located between the two wind sensors. For REMS the hot wire anemometry is based on recording either the amount of power required to heat a wire so that it maintains a constant temperature difference with the ambient (CTA) or to record the temperature of the wire when supplied with a constant amount of power (CPA). The convective power is then calculated, which in turn is used to obtain the wind speed. The REMS wind sensors use a thin film instead of a wire: titanium thin film resistors patterned on the surface of a silicon chip (Domínguez et al. 2008). 4.1 Anemometer/Telltale Wind Speed Issues. Understanding Martian wind is crucial in preparing for future manned missions to Mars. As such, one of the first instruments chosen for Phoenix should have been an anemometer, but Taylor et al. (2008) refer to the failure to do so. Their paper states, “We had hoped to include an anemometer in the MET package. Faced with a lack of resources to achieve this, and the real desire to have some wind information we decided to make use of the SSI camera and have a novel Telltale to achieve this.” See Figure 9. 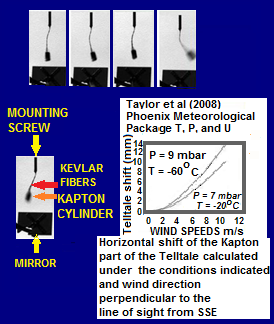 Figure 9 - Phoenix telltale waving in Martian wind. Out-of-phase image may indicate a dust devil occurrence. Images taken before & after the event have west winds estimated at 7 m/s. During the event south winds are estimated at 11 m/s. Adapted from Taylor et al., 2008.